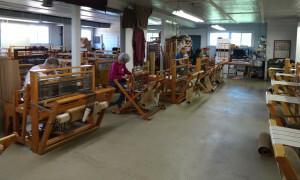 At the end of the day on December 30, 2015, The Mannings Handweaving School and Supply Center of East Berlin, Pennsylvania closed its doors for the last time. That won’t mean a lot to everyone reading these words, but for some of us, it was a day of great significance. In 1960, Harry and Kathrine Manning took over Creative Crafts from Osma Gallinger, who was leaving the business to marry (and take a new name, Osma Gallinger Tod, which will be familiar to many American weavers). The Mannings gave the new facility their name, and The Mannings Handweaving School and Supply Center was born. The school was located on creekfront property in Adams County just off of the whimsically-named Peepytown Road. In 1985, the Mannings were ready for retirement and sold the business and property to Carol and Ron Woolcock. Carol and Ron have run the school and store for thirty years. Through their efforts at expansion and improvement, The Mannings became what it was when I (and many others) first came to know it. Like many other weavers, particularly here in the mid-Atlantic region, it is where I first laid my hand on a weaving loom. To get to The Mannings, you first drove to the middle of farmland between East Berlin and New Oxford. Down a small road and over a narrow bridge across the Conewago Creek, you first saw the big red barn at the roadside, then the old brick farmhouse, and the sign for the school. You would follow the drive between the barn and the house (look out for the barncats!) to the parking lot. Behind the farmhouse was a cluster of low buildings, built to resemble the type of farm outbuildings that would be appropriate to a small Pennsylvania farm like this one. You entered through the door set under the wide covered porch, which had seats for patient spouses. The first thing you noticed was the sheer amount of fiber arts-related merchandise that met your eyes. Right in that first room, there were hundreds of books, thousands of knitting patterns, notions for many different crafts, and skeins and skeins of yarn. Next, you noticed the smell—the magical, never-to-be-reproduced smell of The Mannings. How can I describe it? By itself, it would maybe not seem like an appealing smell—old wood, fiber dust, wool, silk, book pages, and spinning wheel oil. But after your first visit, you would forever associate that smell with positive experiences and amazing things. That smell permeated all of the buildings at The Mannings and a little of it went with you when you left. Wandering back through the long room, you would discover that it led to room after room of more yarn, more equipment, more discoveries. 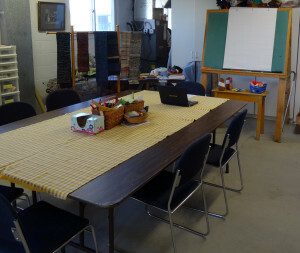 A room full of spinning wheels and weaving looms, braiding stands and basketry supplies. Another room of yarn. A room with a giant clearance rack of more yarn. A long table. An old barn loom. Then, the swinging double doors, sometimes closed with the ominous note, “Class in session,” and the polite request not to enter. To some customers, surely The Mannings was just a store, just a place to buy materials and maybe take an occasional class. But for me, and for many others, it is the place, the single point in space and time where we discovered something that we didn’t know we were looking for, and from which we departed along a new path that we were not expecting. I have felt sad about the closing of The Mannings, but mostly I feel grateful that it was there for me when I needed it. I wish Carol and Ron all the best with the new challenges they face in retirement, and I await with excitement the new venue opening in March by Sara Bixler and Tom Knisely, Red Stone Glen Fiber Arts Center in York Haven, PA.